We love our girls, we really do! If you are considering adding some chickens to your backyard homestead, here are my top 5 reasons to do so. 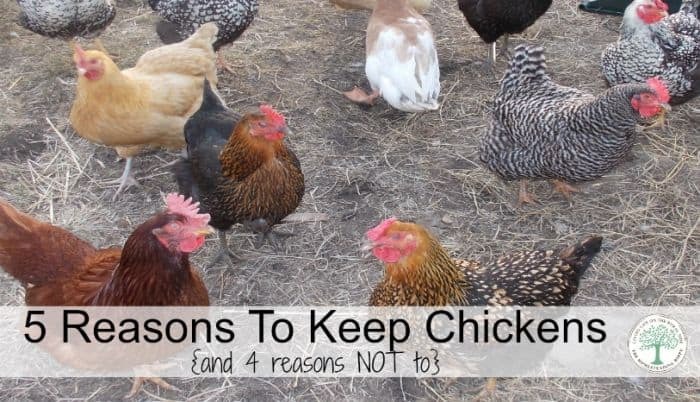 Of course, with 5 reasons to keep chickens, we have to add “and 4 reasons NOT to”. Chickens are great for bug control. They love to dig around for little bugs, and they are pretty adept at catching them mid air as well. Every Summer, when the mosquitoes are all around, it’s fun to watch the hens run around and chase them, jumping up and catching them. Chickens are also really good mousers. As a matter of fact, our hens are better at catching and killing mice than our cats are. This is why we store their food in their coop, covered. We don’t worry about mice, because the chickens will take them out. This goes without saying, that having your own chickens will provide a quick source of eggs. Depending on the breed you raise, you will get anywhere from 250-350 eggs per hen per year. A family of 5 having 10 hens will be well kept in eggs with no difficulty. Of course, if you have laws that only allow a smaller number of hens, don’t despair. Even 3-5 hens will provide plenty of eggs for you! Many people treat their chickens like pets. We do as well, they are “my girls” and they get spoiled often with treats in addition to their regular feed. Each one is named, and I know their personality very well. Some of them will come up to my son and squeak until he picks them up to be petted. But, they are also working animals. When they are done laying, we do make that difficult decision to cull them from the flock and use them for meat. I know that they have had a happy, healthy life and that they are being used to their full potential when we eat them. Some have issues with doing that, and that’s okay. We just choose to keep our flock rotated, and cull the non laying hens. Chickens are so relaxing to watch. Being social creatures, they have a pecking order, and watching your hens you will soon learn who is “on top” and who is “on bottom”. Watching them interact with each other, pecking around, scratching the dirt for worms and bugs is fun. Really. We usually will sit outside, on a warm summer evening, and just watch the girls. It’s even more funny to watch when one gets a worm or mouse. She’ll run around squaking like she’s saying “look what I’ve got” all the while trying to keep the others from getting it. They will chase each other around, and try and steal the treat until one will finally just eat it. Of course, when we sit outside with ice cream, they will try and get that as well…so we will have to put a bit of raw milk in a dish just for them at that time. Nothing is more scary than not sharing your ice cream with the chickens! Trust me. Chickens are excellent at turning kitchen scraps into valuable compost. They can easily turn the compost pile over as well, keeping it aerated. Their manure is high in nitrogen, making it valuable for gardens, especially in “teas”. We give our girls the scraps directly, in the compost pile, and they go to work. It helps cut the feed bill down for us, and they make compost that feeds the garden that feeds us. Permaculture at it’s easiest. Of course, there are some reasons that owning chickens isn’t for everyone. I’d be remiss if I didn’t mention that, right? Especially in cold northern winters when the girls can’t go and scratch for bugs, grass and the like, feed expenses can get really high. And unless you supplement with light during the short winter days, you most likely won’t get enough eggs to counteract the price of the food. Even with supplemental light, our girls still eat 2x the amount of feed for the same or less amount of eggs. We call their dust bath holes “ankle breakers”, because if you don’t know they are there, you could easily trip and break your ankle. Having a movable tractor means that you have to fill in new holes each time you move it. Having a stationary coop means that their dust bath areas can be on one spot, but then they can get really deep. We fill them in early spring with cooled ash from our wood stove, and compost from the pile. But, they can be all over for our free ranging girls. We try to keep some DE on areas that are known to be “favorite” spots, to attract them there. It helps some, but not always. They can also get out of their pens/runs/coop area and quickly decimate a garden within minutes. We have one we call “Hendini” because she can escape nearly anything to taste a fresh, on the vine tomato. Not even during the polar vortex can you stay inside. You have to make sure they have food, their water isn’t frozen and is fresh and collect eggs. Every single day. If you want to take a vacation, you have to have someone watch them for you. If you have family nearby, that might not be too hard, but if you are like us, with no family nearby, you have to rely on friends who sometimes are not willing or able when you want to leave. They are a 365 day job. You also have to make sure their coop and nesting boxes are clean, eggs are collected, as well as cleaning out feeders and waterers on a regular basis, even in cold winters. Having to decide if you need to cull them. This has to be the hardest of all. For many, the chickens themselves become as pets. Deciding if you need to cull one for some reason is not easy. Many choose to just continue to feed a non layer and keep it as a pet. Deciding on “pet” or “production” will never be easy. But, it’s one you may need to make as you look at keeping chickens. Do you own chickens? What would you add to this list of pros and cons? Be sure to pin this for later! Both my husband and I are allergic to eggs so we don’t keep chickens. We could raise meat birds but would rather support our local farmers and buy from them and use our time in other ways. We keep a huge garden and admittedly I’d like to have the compost / manure from chickens but can’t justify it. I wish I could have chickens! One of my number one criteria when we get our next home is that it is chicken friendly! Your reasons not to haven’t deterred me (having grown up on a farmette), but my hubby’s reluctance is more convincing. 🙂 I would love the fresh eggs though! What a colorful bunch of Chickens! Had no idea they came in so many patterns and colors. Pretty actually. I like the idea of them being a source of entertainment. Thanks for these tips, especially the cautious ones. The never having a day off is what gets me. I grew up on a dairy farm so I get that and never wanted that for myself. My husband and I were just talking about this, actually. We have friends that own chickens and sell the eggs. We are considering getting a few for ourselves. Not to sell the eggs, just to have for us. Thanks for the info! It’s a great start to our research! For us actually the meat is in the negative category. I haven’t found it worth it to raise chickens for meat because the cost/expenses of raising them is too high, especially since we can get them so cheaply from our local Huttterite colony. I do like them for everything else though! Thank you so much for sharing some reasons not to keep chickens. I feel like a lot of folks get into it not knowing how hard it will be, and those poor hens end up abandoned or worse. I remember having chickens when I was younger. The cats in the neighborhood were always terrorizing them! I note a few comments have said not having a day off puts them off. I just want to say that I have chickens and we’ve set it up so that we can go away for a weekend. We use a grandpa feeder and a good waterer that stores plenty of water and they have been fine. We can leave on a Friday evening and come back on a Sunday morning. They normally free range but the enclosure they are in has a small run undercover so they don’t need to be let out. So I think it depends on your setup. Mind you I’m in Australia and don’t have freezing winters but surely when it’s not really cold you could go away overnight with the right setup? I love that they eat the mosquitoes and provide fresh eggs, but a 365-day responsibility is too much for me. Great post! We just moved to a city where owning chickens is allowed. This summer we were planning on getting some. We keep them for the spring/summer for eggs and then slaughter them at the end of the season. The kids are going to love it! The 365 responsibility is different from having another pet..how? I have 2 large (90 lb each) dogs, so taking them along on a airplane is a no-go…I have to get someone to stay with them. I suppose it’s easier to find a dog-sitter than a chicken-sitter? I love my chickens!! They are pets though–that leave us eggs. We spend a lot more time/money than they provide for us in eggs but they are worth it, just like any pet would be. An additional reason to have chickens for us is to “sanitize” behind the cows. Having them out there picking up the cow’s waste also cuts way down on the feed cost, so it’s a win-win for us. Gotta love when everything works in sync! I love your list of pros and cons- this is great for people to see! I love my bunch of chickens- we have 12 hens and 1 rooster right now. I think the benefits far out weight the downsides, but they surely are not for everyone. I think a con that could be added would be that you must be willing to deal with sickness and/or death. I’ve had to inject meds into the chickens ( which, through experience, I have learned is much easier than giving them orally!) and we have had to humanely dispatch a few of our birds because of sickness or bad temperament. I suppose you could bring them to the vet, but it’s hard to find vets that will see chickens, and its super expensive! As far as pros- you’ve hit the nail on the head- they are so entertaining- better than TV! Something else to add- you can make new friends through keeping chickens, I definitely have! We’ve talked about chickens. I’d love to have them, but I haven’t convinced my husband. He brings up some of your cons. Another problem for us is that our neighbors breed dogs and keep lots of them in pens. Our yards are only 1 acre, so their dogs would go crazy if we had chickens. I’m stopping by from BYB. Every winter is a con for us because of the reasons you listed, except it can be more extreme in reality. Every winter I say I ain’t doing this again next winter, but I usually forget and do it anyway. This is a great list. I’m currently researching chickens so I can build a coop this summer to get some early next spring. I grew up in a rural area. I wish I had the ability to raise chickens with my boys. I’ve always wanted chickens, lately our family has been spending $60+ a month on eggs. Hubby would rather support local farmers, which I can’t blame him. This is something we want to do! I can’t see us doing this till we have a ton of land, but still. My husband eats eggs, and chicken, so it’d be good to have them around. I’ve wanted them forever! Great post. On the con side, you forgot mucking out the coop on a regular basis. Even though our girls are free rangers, the amount of waste 20 chickens can produce in their sleeping area is, impressive. I let my hens run free and I miss the option of being able to walk around in my back yard barefoot without having to pay close attention to where I step. Mine hated tomatoes, but would strip my broccoli and cauliflower to the stem! Free range equals chicken poop between your toes! You had to be careful at Grandma’s house in the yard or you would get chicken poop between your bare toes! Yuck! Thank you for the post regarding reasons to keep and reasons not to keep chickens. We are considering adding chickens to our urban homestead and this is helpful. read your blog and follow the new posts when I receive notices from facebook. I have just recently started a homesteading blog myself that is located at southernurbanhomesteader.wordpress.com and would appreciate it if you would check it out.